What a great giveaway Sparkle! Yous is just the bestest! Me chooses Tabbyâ€™s Place. Forever Home Feline Ranch gets my vote! Thanks for this giveaway. I’m sure the kitties will appreciate it! We love this idea! You spread it about, Sparkle, as we have no idea who is good in the US and who isn’t. Meow! Dane County Humane Society in Madison, WI. what a wonderful way to help other kitties! we would like to enter Sumter TNR Kitten and Rescue (http://www.sumtertnr.org/). Thank you for being so generous. That’s very nice of you to have this giveaway Sparkle! We’d like to nominate Tabby’s Place too! PeeS: We thought we were signed up for your newsletter but now we don’t think we are. Hmmm. 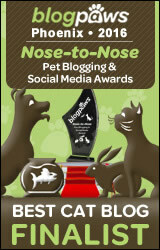 We would nominate our good furriends at PAWS (with the blog Animal Shelter Volunteer Life with meowmeowmans). Thanks Sparkle, this is a special give away for sure! Please Sparkle pick us! Forever Home Feline Ranch. Thanks for your consideration ! WOW that sure is a pawsome gift to a shelter ! I’d like to nominate Rikki’s Refuge, Orange, VA. Thanks for sharing! Wow! That is a great idea/prize! I would love it if Winnie’s Wish won that!! That’s Chrystal’s rescue on the Daily Dose blog! Awesome! We’d like to win for Brigid’s Crossing. Check out our big giveaway for a KatKabin! I nominate Forever Home Feline Ranch…www.felineranch.org! FHFR loves Sparkle! Thanks for your consideration! you are an awesome cat to share so much with the homeless kitties. I nominate Forever Home Feline Ranch. (www.felineranch.org). Thanks again for all you do. Thank you so much for offering these! I’d like to vote for Rikki’s Refuge in Orange VA –they have been a safe harbor for many special needs kitties in their area and have helped our rescue with special needs kitties from Georgia also. I nominate PurrEver Ranch Sanctuary. I would also like to nominate the Forever Home Feline Ranch in Springfield, IL. Forever Home Feline Ranch provided me with my three cats Skylar, Purrl Grrl Janis, and Miles, best cats ever. Sparkle you are one amazing cat! You are always helping out cats in need-we salute you and your staff. We would like to nominate the Forever Home Feline Ranch in Springfield, IL. Forever Home Feline Ranch LOVES Purina products. Thanks for the opportunity. I’d give it to the shelter I foster for..
What a great giveaway! If I win, I want to donate to our local shelter, Furkids, where we adopted Niko from! The John Ancrum SPCA in Charleston, South Carolina. What an awesome idea Sparkle!! Thank you!! We’d love Life Savers Animal Rescue here in Polson, MT to win! All the animals are fostered, and I know they could use those coupons! We would really, really like Winging Cat Rescue to win the coupons … the wonderful ladies there work so hard to save lives and they saved ours. We know the Space Coast Feline Network could use these. All kitties are fostered in private homes! We vote for Purrfect Pals in Arlington WA! They gave us Ichiro (and I am working on getting them to take him back). That is awesome of you….. we chose our local rescue ColonyCats.org (that is the place that helps us out with a lot of the kittens that show up at our house – including the alcohol kitts). It is wonderful of you to work so hard for kittehs in need. You are wise and kind, Miss S.
That is so cool Sparkle and some shelter will be so happy. We will pass though since we were there too and gave ours to our shelter already! 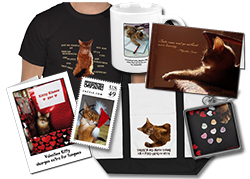 Sparkle, you are so sweet to want to help other kitties in need. We ruddy Somali girls put it to a vote and we pawsitively want the coupons to go to Tabby’s Place! Even our FurMom voted for Tabby’s Place (She fell in love with Dot). What a fabulous give-away, Sparkle. We know the winning shelter will be so grateful! We are confused (no change there then!!) we don’t think we can enter but if we can we’d choose Tabby’s Place. Since the winnings go to a U.S. shelter anyone can enter! What a wonderful thing you’re doing Sparkle! We don’t know if Chrystal is 503(c), but we’d like those coupons to go to her. No matter what shelter wins, Sparkle, this is a great thing you are doing!! You know which shelter we would like to have those coupons and that is Tabby’s Place. They do such a good job. This is just terrific that you are doing this.Take care. Thank you fur all you do to help kitties! We would be elated if The Suffolk Humane Society won your coupons! We love you! Have a good weekend. We’re purring to only get rain from Sandy here in VA! Our purrs go out to all in her path! My dear, you are always doing such lovely things for kitties in need. I hope you know how much we appreciate knowing there are kind people/kitties in the world like yourself.